Want to really take your next adventure up a few notches? You need the best ultralight tent to take with you on your next backpacking or camping adventure. These little beauties are super lightweight and are easily carried in your backpack without you even noticing they’re there. They come in a range of sizes and can fit anywhere from one to three people. So you can have an awesome solo adventure, a romantic getaway, or some time with friends. Weight: This is especially important when we’re talking about ultralight. This is what makes these tents so special. Think about how much weight you want to add to your pack and what features you can live without. Waterproof: You never know what’s going to happen when you’re camping, so be sure to select a tent that is waterproof if you are concerned about rain or inclement weather. This will help you stay calm and dry when it starts pouring. Warranty: Knowing that the manufacturer stands by your tent help you adventure without stress. Warranties also ensure that if anything goes wrong with your tent while you’re adventuring, there’s someone to fix it when you come back. Colors: A tent is something you’ll be using a lot and most likely how you will identify your campsite. Pick a tent that comes in a color that you like and can easily see from a distance. Occupancy: Are you more of a lone wolf or do you have some friends who like to go camping with you? Choose a tent that most suits your needs as far as who’s sleeping in it. Pole Included: You need something to put the tent up with, so make sure you choose a tent that comes with poles included. If you have some tried and true favorites that fit your tent, you may not need poles. So let’s get right to it, choosing the best lightweight tent for you. If you’re itching to get back out there, check out our top and budget picks. They’re the best of the bets. If you really want to do your research, be sure to check out our other eight picks. They’re also great choices for anyone looking for an amazing and lightweight tent to take with them on their next camping trip. So let’s get out there and get camping! This is our top pick for the best lightweight backpacking tent, the WEANAS Double Layer. 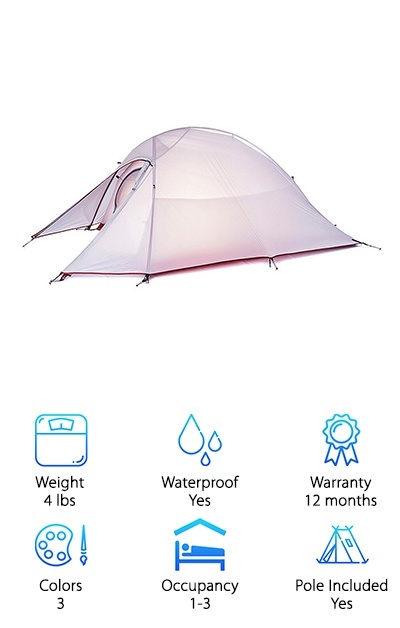 This is a great tent for anyone looking for something that is light, versatile, and easy to carry. It comes in three colors, so you won’t have to sacrifice style for utility. It is wind and rain proof, just in case the forecast changes right before your big camping trip. It has a big screen that zips back so you can stargaze from the safety of your tent, away from the bugs and other forest critters. All of the seams are taped with waterproof tape and the design allows it to function well even in serious weather conditions. The company offers a year-long warranty, so you know that they are confident in the quality of their designs. It comes in two sizes as well, one that sleeps 1-2 people, and one that sleeps 2-3 people. It’s a great tent for backpacking or any adventure you want to take it on! If you’re on the hunt for the best light tent for your money, the Yodo Backpacking tent is the one for you! It’s made of durable polyester with PU coating. It comes complete with a rain fly ventilated roof and two durable poles. It also comes with an easy entry front door and a two-way zippered mesh window, you won’t feel cut off from the beautiful surroundings you came here to enjoy. The mesh will keep bugs and mosquitos out, as well as other critters you don’t want to share a bed with. This tent is easy to set up and comes with its own easy to pack carry bag. It’s only 3.3 lbs. The carry bag makes it easy to attach to your backpack or keep separate from your other camping gear. It comes in three colors- green, blue, and orange. This means that it’s ideal for any style and you’ll always know which tent is yours, as the colors are very vibrant. This is a great option for anyone looking for something closer to lightweight camping tarps. It is has a great style and looks very modular. The design makes it easier for the rain to roll of-of he tent while you are sleeping. This is a great ultralight one person tent and is a great option for anyone who doesn’t like sharing their sleeping space or likes to adventure solo. It’s a great versatile shelter system that allows you to carry only what you need for your big adventures. 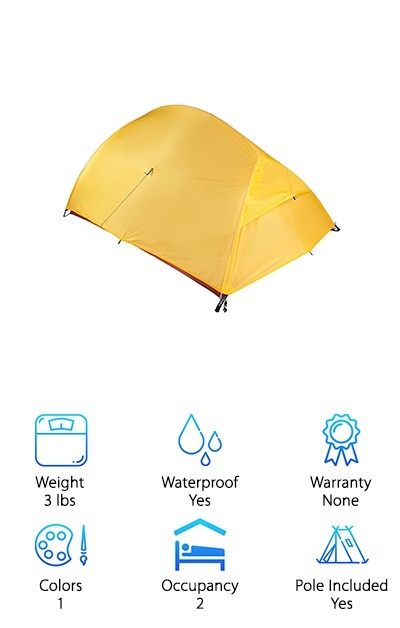 It comes with a rain fly and a tent, along with the other necessary assembly accessories. The flysheet is made of double-sided silicone coated 15D nylon ripstop fabric. This fabric has a waterproof rating of 200mm. The inner tent is made of B3 high precision nylon gauze. This makes it really breathable for long nights when you want to feel a l=part of nature, not separated from it. This tent’s poles are made of aluminum alloy. 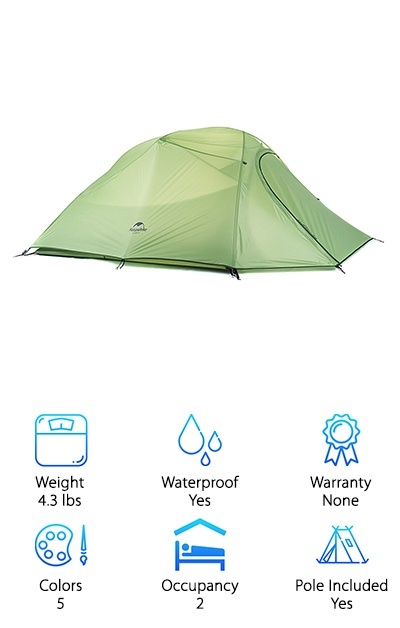 This is another great choice if you want the best ultralight backpacking tent but with space for someone to come along on the adventure with you. It provides great protection and sleeping space for two people. The 30 DEnier rip-stop silnylon floor has a silicon and PU dual coating for incredible protection against water. The seams are also fully taped, so you won’t have to worry about water seeping in the bottom of your tent and ruining your fun. This is a super lightweight tent, at only 24 ounces, you may not even notice it in your backpack. The mesh allows you to easily stargaze from a sanctuary protected from bugs and creepy crawlies. This tent even comes with two fifteen foot pieces of 1.5 mm reflective Dyneema guy line and six aluminum Y stakes. These can be used creatively to pitch the tent using nearby trees for support. 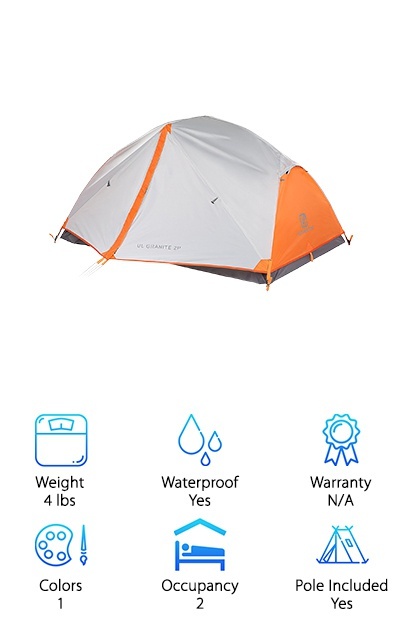 This tent also has a lifetime warranty. The Featherstone Backpacking Tent is a great choice for anyone looking for a great ultralight two person tent. 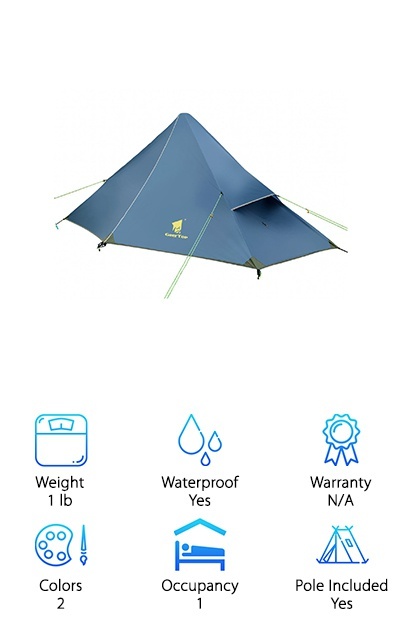 It is made with lightweight micro nylon- mesh which means you won’t have any trouble getting to sleep or feel that you are disconnected from the outside world in your tent. It is designed with a rugged bathtub style floor for maximum protection from the forest floor and from inclement weather. This tent comes with two vestibules, which provide a great storage space for your camping gear and your backpacks. 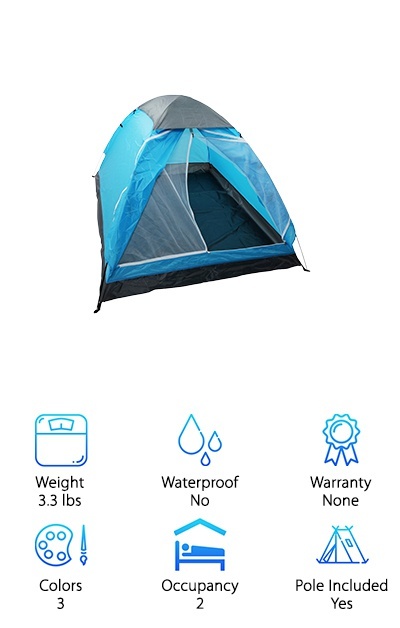 This tent is optimized for two people, complete with two doors in case one of you likes stargazing a little more than the other. It comes with a single pole structure, making it easy to pitch in a pinch. This tent is also suitable for three seasons of camping, meaning nothing but the dead of winter can stand between you and adventure. This tent even comes with its own carrying case. If you're more of a lone wolf, you may need an ultralight solo tent. This cool looking one by GEERTOP is a great choice for three seasons of camping. This is a great option for people who like to really adventure on their own, and go on long and amazing camping trips as an amazing solo adventure. This tent doesn’t sacrifice one style and comes in two colors. The colors are an iron blue and a bright orange. 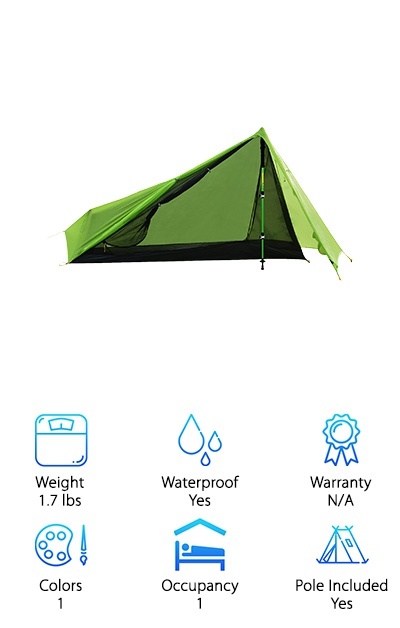 This tent comes with a flysheet and an inner tent, the flysheet weighs only 790 grams and the inner tent is just shy of a pound. This tent comes with 100% waterproof zippers and is made of high-quality material. The flysheet and the inner tent can be sold and used separately. This tent comes with two doors and two ventilation windows, for those stifling summer nights. The flysheet is made of 20D silicon coated nylon, which means it's both light and waterproof. This bright yellow beauty is a great pick for anyone who wants to stand out when they’re camping. If you’re reading this ultralight tent review looking for something that stands out from the crowd, here it is. This is a very lightweight tent, weighing in at just three pounds seven ounces. 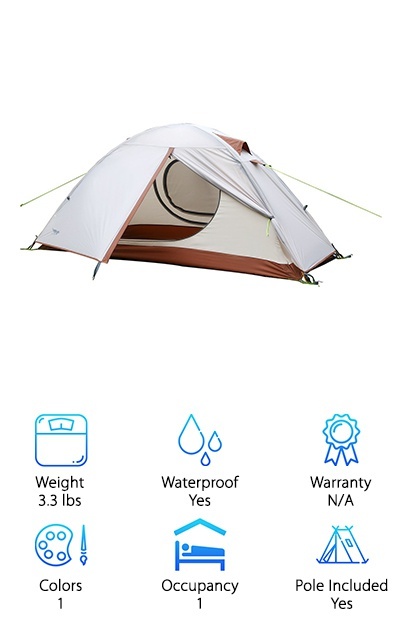 It comes equipped with all the feature you expect in a tent, even though it is so lightweight. It comes with two way inner and outer zippers, mesh pockets, a back vent complete with a kickstand, a pole repair splint, 12 Y-stakes and Dyneema guy lines, taped seams, and 5,000 mm silicon/PU waterproofing. What more could you want in a tent that weighs less than your cat? These materials are quality as well, 20D ripstop silicon/PU fly, 40D ripstop silnylon/PU floor and footprint, 20D no-see-um mesh, and 7000-series aluminum alloy poles and stakes. This is a great choice for anyone looking for a quality tent at a fraction of the price. This is an awesome two-person ultralight tent that comes in a wide variety of colors to ensure your style shines, even if only bears can see it. It comes in five colors. The colors are grey, white, light green, neon green, and light orange. This tent fits two people so bring your best ultralight backpacking stove along for the ride and have a romantic starlight dinner. The tent is made of 2010T nylon and is waterproof indexed above 4000 mm, so you know you’ll be cozy, warm, and dry afterward. 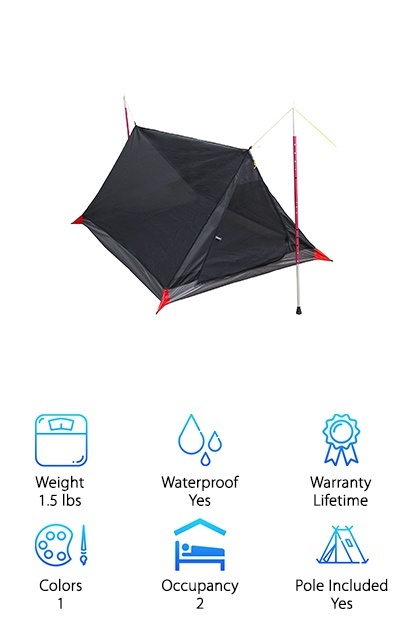 This tent only weight 3.3 ounces without the poles. It comes in at about four pounds and three ounces with the poles. It has more than a 28-foot area for sleeping, making sure that you’ll be comfortable in your tent. The length can be up to 6.89 feet, to accommodate your tall friends. It comes with eight pegs for putting up the tent. It is graded against the wind at a 7. This is a great tent for people looking to bring someone else with them on their adventure. It’s a two-person tent that can work in all four seasons, so even your snowy camping dreams can come true. The inner tent is made of breathable nylon mesh for the most effective air ventilation and protection against bugs. It comes with a rain fly and a ground tarp for nights when you have inclement weather. There is a pain-free color-coordinated setup to help you enjoy your camping trip instead of cursing at the heavens when trying to piece together your shelter for the night. It comes with both front and back doors as well as 1 mesh vent. This tent provides ample space for two people to sleep and lounge comfortably. It has reflective strips to enhance the visibility of your tent at night, so you won’t ever lose it! This is a great tent for a two-person trip. If style is your main objective when choosing a tent, this is the best ultralight 1 person tent for you. The white and brown exterior looks like it popped straight out of a vintage hipster dream, and you’re sure to get people asking you where you got that rad tent. This tent not only looks good, it performs well too. It includes a silnylon fly that is 8000 mm water-resistant and also boasts UV resistance. It can quickly quick both snow and rain. This is an all-season tent designed for year-round camping adventures. IT performs well in both hot and cold weather due to the excellent venting provided by its two doors in the summer, and the fact that they are double layered for winter. It includes four reinforced panels as tent corners that can sustain constant tension when the tent in use. 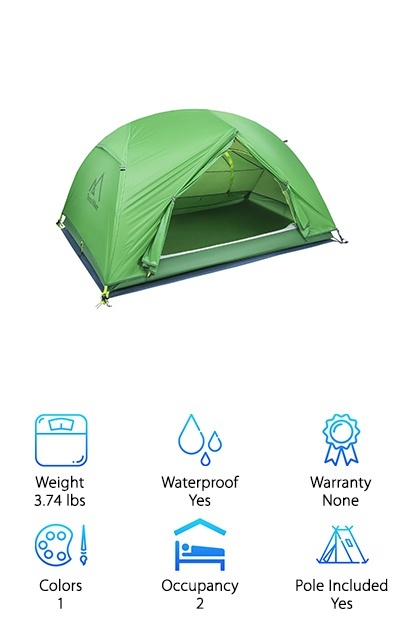 This tent includes two spacious vestibules for storing all of your gear safely.